Search the Rent in France directory for French self catering holiday rental homes in Aquitaine, France. This region is very popular with holiday-makers travelling to France. Rent-in-France offers many self catering holiday villas, apartments, houses and gites to rent in Aquitaine, France. The five departements of Aquitaine are Dordogne | Landes | Gironde | Lot-et-Garonne | Pyrenees-Atlantiques. Aquitaine can be found in the south western part of France, along the Atlantic Ocean and the Pyrenees mountain range on the border with Spain. Aquitaine covers an area of 41,308 sq / km, 7.6 percent of the country's total area. It is bounded by Spain to the south, to the east by Midi-Pyrenees, by Poitou-Charentes and Limousin to the north and to the west by the Atlantic Ocean. Some of the major cities in Aquitaine include Bordeaux, Pau, Bayonne, Mont-de-Marsan, Biarritz, Bergerac, and Perigueux. 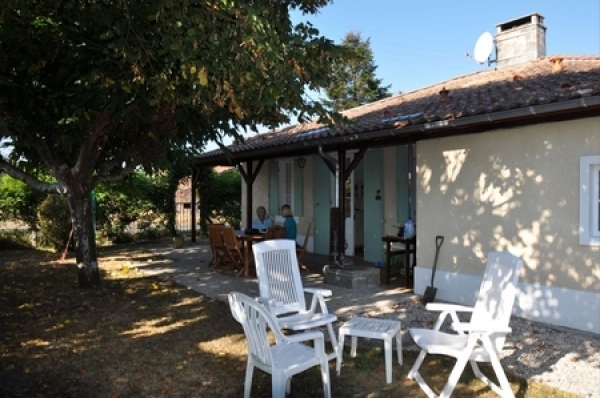 Rent a self catering Aquitaine holiday rental property and enjoy a region that has been blessed with a gloriously sunny climate and a wonderful landscape of vast forests, snow-capped peaks, vineyards and rolling sand dunes. For all you wine lovers out there a holiday rental in Aquitaine is the place for you, wine cellars are very popular in this wonderful area of France. Famous for its wine some of the best wine and brandy products across the globe come from this area. These include Armagnac, Lillet - a fortified wine produced in Bordeaux, Bergerac - which is produced in the Dordogne, Sauternes- a famous sweet white wine and the most famous of them all Bordeaux wine - also known in the UK as Claret. The Aquitaine region is one of the most famous red wine producers in the world. Situated in the south and bordered by the Atlantic Ocean, Aquitaine offers you oceanic climate where the whole year is somewhat mild. With approximately 2200 hours of sunshine per year the region has that Mediterranean feel but with the sun comes the rain and this is one of the major factors why the region is famous for its wine as it is the ideal climate for vine growing. The summer months will see the average temperate rise to about 25° where as winter in Aquitaine will rarely see the temperature drop to below 10°C. There are a large number of thing's to do and see during your Self catering holiday rental in Aquitaine. These include the Dune de Pilat which is said to be the largest sand dune in Europe, the Cote d’Argent ,one of the most famous coasts in France and the Bassin d’Arcachon which is famous for its oyster farming. Some popular events include Bull fighting, very popular in the region and surfing, in fact major surfing championships take place on the Atlantic coast regularly throughout the year. Aquitaine is also home to the Landes Forest, famous for being the largest pine forest in Western Europe. Biarritz is a fantastic destination to be in the summer, especially to lovers of French culture. Biarritz, only half an hour from the Spanish border, is considered the surfing capital of Europe, and is an extremely popular spot with young and trendy surfers. Enjoy the famous Grand Plage beach and take a trip the art deco Casino and Museum of Chocolate. Perigueux is considered to be the capital of the Dordogne region. Perigueux is a buzzing town and has been the centre of the Dordogne region for over 2,000 years and makes an ideal touring base for the chateaux and lakes of the Perigord Blanc. There are essentially two towns to see at Perigueux, the medieval town and the roman town. Saint-Emilion's history goes back to prehistoric times and is a World Heritage site, with fascinating Romanesque churches and ruins stretching all along steep and narrow streets. Saint-Emilion is one of the principal red wine areas of Bordeaux along with the Medoc, Graves and Pomerol. The region is much smaller than the Medoc and adjoins Pomerol. As in Pomerol and the other appellations on the right bank of the Gironde, the primary grape varieties used are the Merlot and Cabernet Franc, with relatively small amounts of Cabernet Sauvignon also being used by some chateaux. Don't miss the Eglise Monolithe, because it's underground and carved out of the limestone. It dates from the 9th century and is Europe's largest subterranean church. Bordeaux is a port city on the GaronneRiver in southwest France, with one million inhabitants in its metropolitan area at a 2008 estimate. It is the capital of the Aquitaine region, as well as the prefecture of the Gironde department. Its inhabitants are called Bordelais. Bordeaux is located close to the European Atlantic coast, in the southwest of France and in the north of the Aquitaine region. The city is built on a bend of the river Garonne, and is divided into two parts: the right bank to the East and left bank in the West. Bordeaux is best known for its wine. With an annual production of over 700 million bottles, Bordeaux produces large quantities of everyday wine as well as some of the most expensive wines in the world. The Dordogne is a region of South East France between the Loire valley and the High Pyrenees named after the great river that runs through it. Locally it is known as the Perigord. It is surrounded by the departments of Haute-Vienne, Correze, Lot, Lot-et-Garonne, Gironde, and Charente, 6 departements. It is the third largest department of France. Dordogne has become one of the favourite destinations of British immigration to France. The Great Dune of Pilat is the largest sand dune in Europe. It is located in La Teste-de-Buch in the ArcachonBay area, France. It is south of the ArcachonBay, about 60 km from Bordeaux. The Dune reaches a height of 100m and the view of the ocean at the summit is spectacular. On a clear day you can see the Pyrenees mountains. By Air Daily services are offered in and out of a number of airports throughout Aquitaine by both national and international companies. From the UK Easyjet, Ryanair, Flybe, Bmi Baby all offer low cost flights to the following airports in Aquitaine, Bergerac, Pau, Biarritz, and Bordeaux, all of which receive flights from a number of airports across the UK that include London Gatwick, London Stanstead, London Luton, Manchester, Birmingham, Bristol and Southampton. By Train - Aquitaine is a major point on the French rail system. With full rail links available in and out of Aquitaine which is also served by the Atlantique high speed train T.G.V Paris is only 2 hours ways. This major transport hub provides a rapid service from Aquitaine to major cities across Europe. By Sea - The towns of Bordeaux and Bayonne are home to two fantastic ports which mean you can arrive by sea right into the centre of Aquitaine. By Road - If driving is preferred then there are a number of majors roads that head straight into Bordeaux. Take the A10 from Paris, the A62 from Toulouse or the A89 from Clermont-Ferrand to Bordeaux. Sourdeval Holiday Home Rental in Manche, Normandy, France ~ Vengeons Sleeps 6 people in 3 bedrooms, 2 Bathrooms.